Light(er) Mac & Cheese – Tasty? | Mmm, Tasty! Yesterday I was really craving a comfort food type meal, but didn’t want to load up on calories. The idea of having some sort of baked pasta struck me, and I started searching for a yummy but more nutritious macaroni and cheese. Rich pulled out our old Moosewood cookbook, pointed to this recipe, and voila, there was dinner! I’ve modified the recipe from the original a bit. The original called for cabbage to be added in with the rest of the vegetables, but I really didn’t like the sound of that, so I omitted it. Without the cabbage, it was very tasty! Maybe next time I will try adding cabbage and see what I think. From the Moosewood Cookbook, by Mollie Katzen. Lightly modified by me. 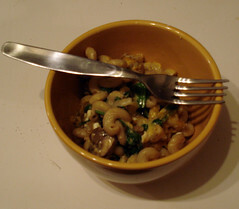 Cook the pasta in a large pot. Drain and set aside. Melt butter in a deep skillet, and saute onions for 5 minutes. Add garlic, mushrooms, salt and caraway seeds. Cook for about 5 minutes, or until mushrooms are cooked. Stir in spinach, remove from heat, and add to pasta. Mix in cottage cheese, buttermilk, dill, black pepper and half the cheddar. 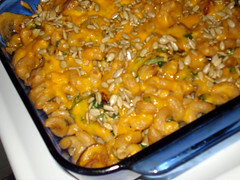 Spread in prepared pan, sprinkle with remaining cheddar and sunflower seeds, and bake uncovered for 20-30 minutes. I served this hot, but it’s pretty tasty at room temperature for lunch the next day, too.